In the previous verses, Prophet Samuel has just anointed David. The Spirit rushed powerfully onto David, and the Spirit departed from Saul. David's rise begins, and Saul's descent has begun. Did Saul examine himself to see if he was in the faith? No, he didn't. Instead, Saul addressed the symptom. Let's soothe the demon, not investigate why I have a demon. Saul did not appeal to the LORD, he did not pray, he did not sacrifice. Here is another resource in which we look at practical ways to examine ourselves to see if we are in the faith. JC Ryle's first chapter in his book Practical Religion, the chapter is called Self-Inquiry. Ten questions for self-examination. Saul failed to meet the test. Christians if they are true believers will never have the Holy Spirit completely removed from them. God's hand will never completely release them, they (we) can and do endure seasons where God has withdrawn temporarily. Saul sinned. He never took spiritual inventory. He never went to the source. He only salved the symptom. William Congreve famously said, "Musick has charms to soothe a savage breast," but the savagery always returns. Repentance and dependence on the LORD will quell the terror. 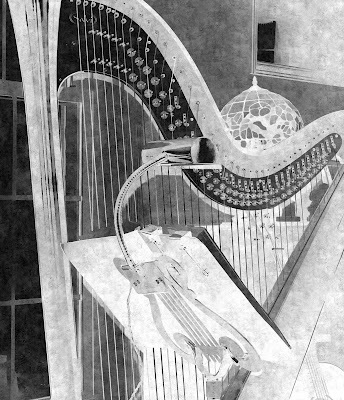 Harps only go so far.